A new Docklands Light Railway (DLR) station has been opened by London Mayor Boris Johnson - two days after his predecessor unveiled it. 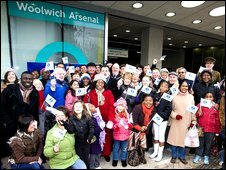 Woolwich Arsenal, in south-east London, was opened to the public on Saturday by former mayor Ken Livingstone. 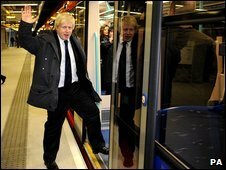 But Mr Johnson officially opened the terminal saying it puts Woolwich Arsenal firmly on the Tube map. The opening marks the completion of the £180m DLR extension which is a part of the transport plan for the 2012 Games. The extension connects King George V station on the north of the River Thames to Woolwich Station. Mr Johnson said: "I am absolutely delighted that this extension of the DLR with its cracking new station is up and running and puts Woolwich Arsenal firmly on the Tube map. "Woolwich has long lacked the transport links that encourage the creation of new jobs, homes and shops, and this is exactly the sort of project that will help kick the credit crunch where it hurts. "The extension will also play an important role in the Olympic transport network. "People in this part of London will now be just a 24-minute hop, skip and a jump away from the Olympic site." Greenwich Council's leader, councillor Chris Roberts, said: "This is the catalyst to creating a new Woolwich and is a fantastic boost to the regeneration going on all around us." On Saturday, Mr Livingstone said he did not find it odd that there had been two 'openings'. He added: "The borough council here decided to put this public opening on and the people here have been waiting for this for decades. "The council fought for this, the local MP has fought for this for years, and it is really nice to see one I started earlier."